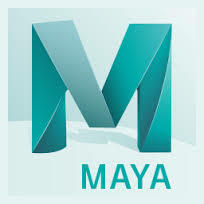 Proteins can be secreted, or transferred out of a cell, by multiple pathways. In regulated secretion, proteins are secreted from a cell in large amounts when a specific signal is detected by the cell. Cells produce proteins that serve specific functions. Some cells have a specialized function to release specific proteins required under certain cellular conditions. Beta cells in the pancreas secrete insulin, some nerve cells (or neurons) release neurotransmitter proteins, and specific pituitary cells release one of many peptide hormones. All of these cells have one common feature: secretory vesicles. 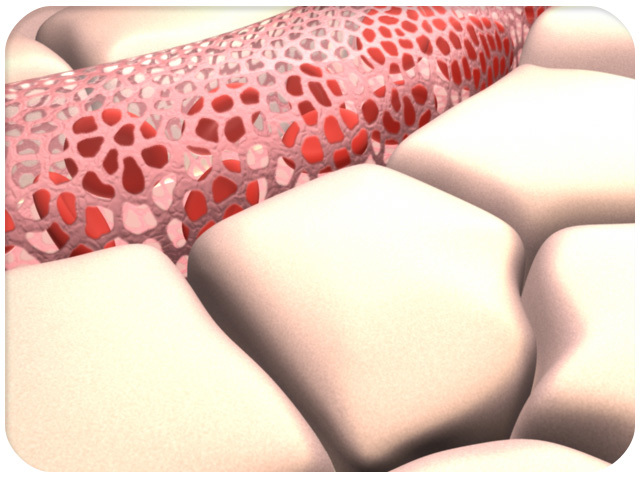 A secretory vesicle is a membrane bound compartment that stores large amounts of a specialized protein. Looking into a pancreatic beta cell, you will find secretory vesicles filled with insulin, while in a nerve cell the secretory vesicle may be filled with serotonin or another neurotransmitter protein. Remember that in constitutive secretion, vesicles from the trans-Golgi network are sent to the cell surface for immediate secretion. Whereas in regulated secretion, vesicles containing the product for secretion remain near the cell surface until a specific signal arrives that triggers secretion. Here we see a pancreatic beta cell–one of the cell types found in the pancreas. 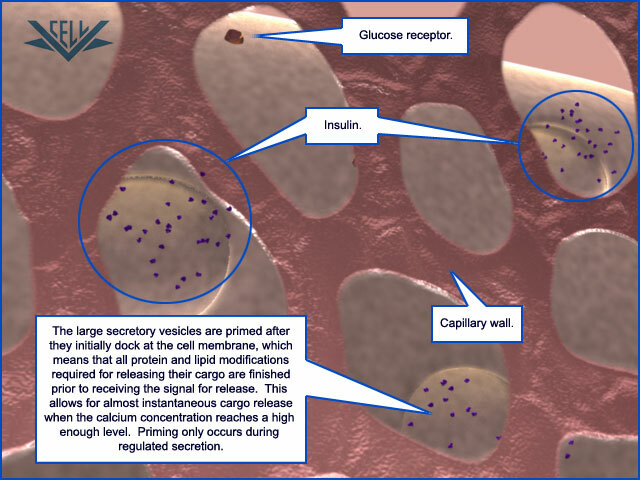 In these beta cells, the secretory vesicles are filled with insulin. As with many proteins, the insulin protein is processed in the Golgi apparatus and secreted in vesicles. 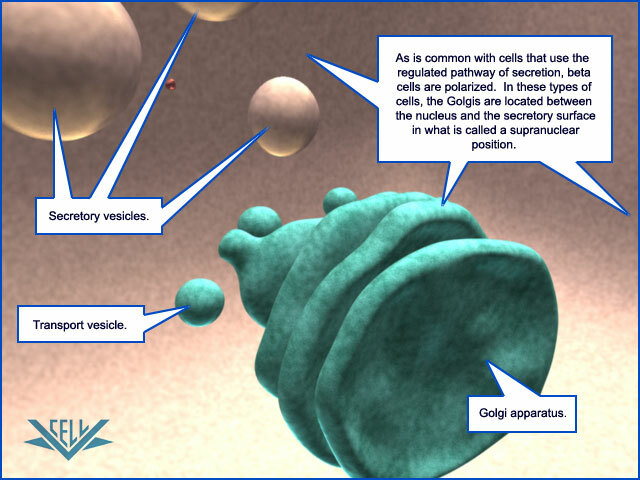 Secretory vesicles are all derived from transport vesicles leaving the trans-Golgi network. 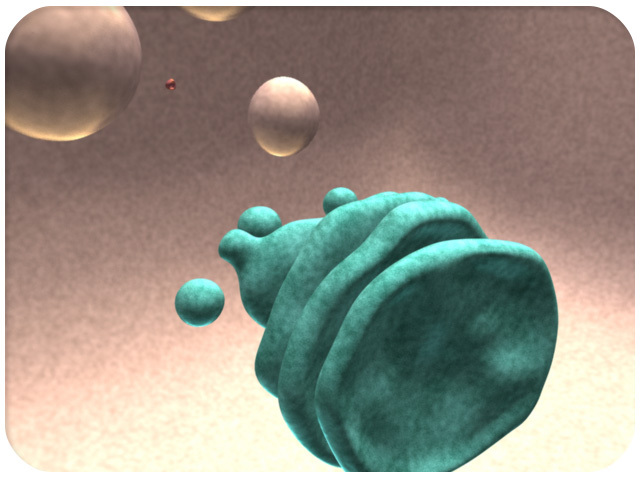 In these specialized cells, vesicles containing the same cargo protein will fuse to form larger secretory vesicles. 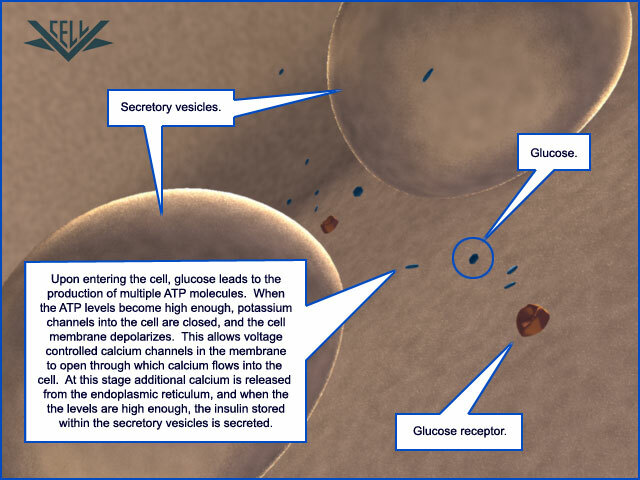 Vesicles containing insulin build up in the cell until a glucose signal enters the cell. Glucose itself does not directly cause the release, but in the presence of glucose a complicated process is initiated, leading to the release. The key point, is that the secretory vesicles containing high concentrations of insulin move to the plasma membrane at the cell surface and release the protein to neighboring blood capillaries. 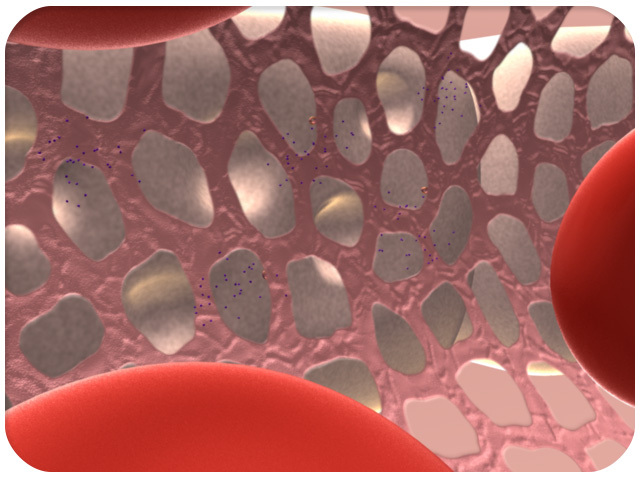 This entire process couples the creation of the secretory vesicles with regulated release and is called exocytosis. 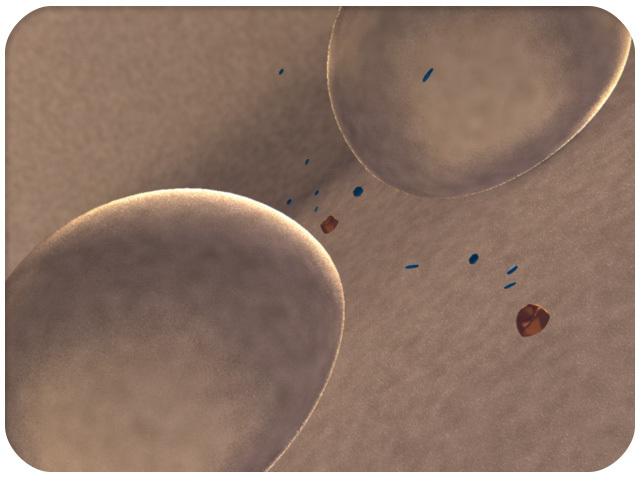 In this case, the released insulin in turn acts as a regulator that stimulates the release of glucose transporters in other cells via exocytosis. Collectively, this is a classic example of how different exocytosis events are coupled for the normal cellular and physiological function of an organism. 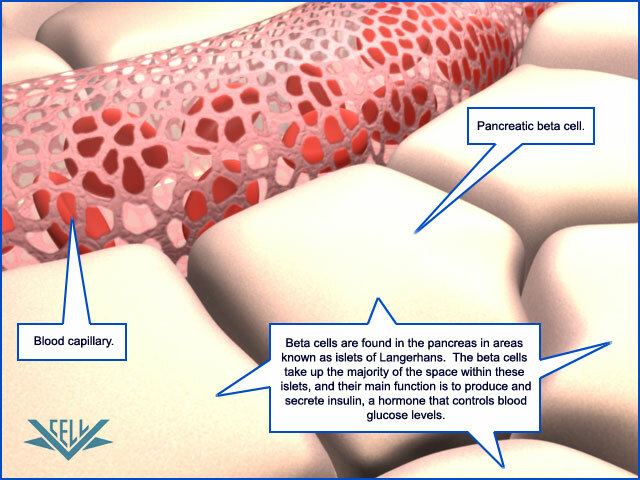 An example of a polarized cell type that engages in the regulated secretion of a specialized protein is the beta cell, a type of cell found in the pancreas that secretes insulin. 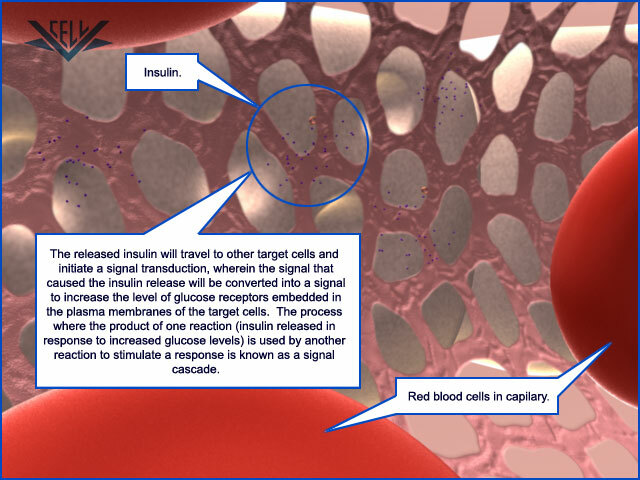 Insulin travels from the endoplasmic reticulum into the Golgi apparatus where it is packaged into transport vesicles. 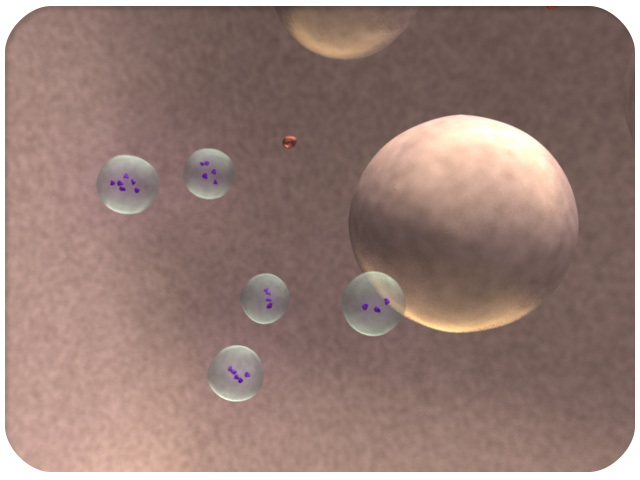 Insulin-containing transport vesicles from the trans Golgi network fuse at the cell membrane to form large secretory vesicles. 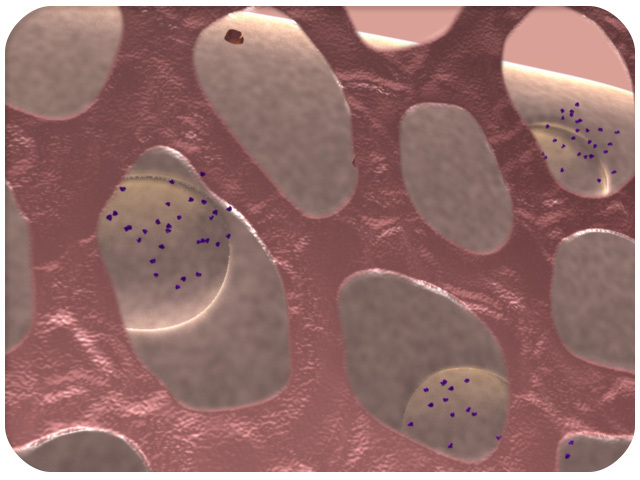 When glucose molecules enter the cell, a sequence of events is put into action that results in the fusion of the secretory vesicles with the plasma membrane of the cell. Exocytosis is completed as the fusion of the secretory vesicles into the cell membrane releases insulin into neighboring blood capillaries. 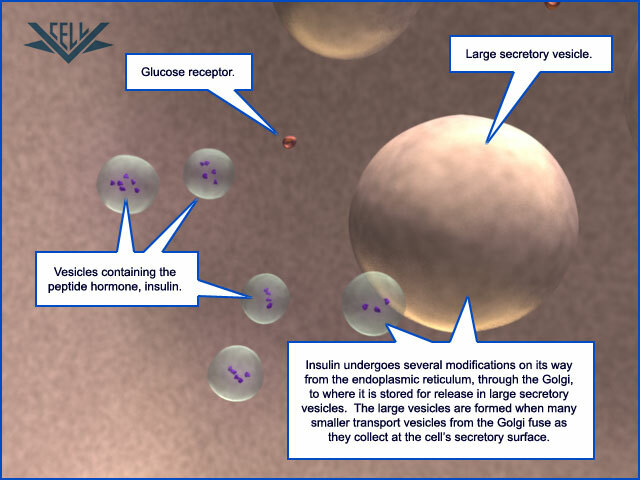 The released insulin goes on to stimulate the release of glucose receptors into the membranes of additional cells, also by the exocytosis process.